Ten years later, as we began editing the 10th anniversary issue, we were again captivated by a world in revolt. With excitement and awe we watched the people of Tunisia topple the corrupt regime of Ben Ali. The spark spread to Egypt, where for 18 days we were gripped by the sights and sounds emanating from Tahrir Square. Millions of Egyptians inspired by Tunisia had launched a revolution to unseat the Mubarak regime. As in 2000, the protesters took to the streets to demand democracy, propelled by a combination of poverty and lack of economic opportunity. The US government has struggled to respond to the uprisings in North Africa and the Middle East. Right up until the very end the White House effectively supported Mubarak, a man the US has supported for 30 years with billions of dollars in military aid. Journalist Robert Fisk said it best when he pointed out that people’s democratic movements in the Middle East are exactly what Washington fears most — more than terrorism, more than Radical Islam. But if you watch cable news or read the mainstream papers and magazines, you get a very different story. Radical Islam is the greatest threat to democracy, freedom and the US. Two wars are being waged because of this alleged threat, whole political careers in the US are built on it and a mainstream news industry is thriving because of it. For those of us in the US, watching events unfold in the Middle East and North Africa has been compelling and emotionally stirring. Who among us is content merely to observe others fight for their liberation? No, watching these happenings stirs something deep within us all that speaks to our own desire for liberation. The joy we feel in others’ triumph is also hope for our own. As an all-volunteer, grassroots media project, Left Turn is reporting from the fault lines of the global economy. The articles in Left Turn are the stories and analyses of struggle and triumph all too often unreported in mainstream corporate media. Sitting down with a copy of Left Turn is as much an experience of viewing as of reading. In reporting movements — the global intifada — the visual spectacle that is the backdrop, frame and setting for events is as important as the words. In effect, art and visuals are another kind of voice people have to show resistance. In Arabic the word intifada literally means “shaking off,” and we are witnessing how people are actively shaking off the oppressions that tie them down. What will be next? 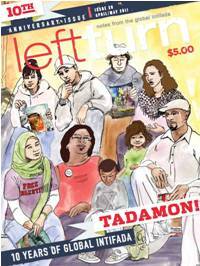 We don’t know, but we can take heart that ten years after Left Turn’s first edition, the global intifada — with all its ebbs and flows — continues … and so does Left Turn. As we move into our second decade, we continue to grow and evolve with the movements we seek to document and celebrate. With this issue we are thrilled to formally welcome Walidah Imarisha to the editorial collective. Over the past several years Walidah has been responsible for editing some of our most groundbreaking content, including the feature section in our recent Other Worlds Are Possible / Visionary Fiction issue. In this issue she edited our special section on the movement to abolish the prison industrial complex. Thank you to everyone who has made this magazine possible over the past ten years. This includes all of our writers; subscribers; sustainers; advertisers; artists; distributors; readers; our fiscal sponsor, the Washington Peace Center; and, of course, the organizers and activists on the frontlines who have inspired us. We would not exist without you, and we look forward to continued and united rising up and shaking off!